"Barack Obama", "Buffett Rule", "Election 2012", "flat tax", "progressive taxation"
Today, Sen. Sheldon Whitehouse is proposing a bill that would institute the Buffett Rule - the extraordinarily simple concept that millionaires, specifically those with more than $1 million a year in income, should pay at least the same tax rate as the middle class (at least a flat 30%) - into the federal tax code. The top 400 tax filers in this country, each making at least $110 million in a year - the uber rich of the uber rich - paid an average federal tax rate of 18% in 2008. A third of these taxpayers paid less than 15% (Mitt "Corporations are people, my friend" Romney is included in this select group of tax dodgers) and fully 85% paid less than 30%. The effective tax rate on a middle class business owner earning $70,000 a year? 28%. The other (but a smaller) factor in the extraordinarily preferential treatment of the super rich in our tax code is the use of deductions or tax expenditures written into the federal tax code, which also disproportionately benefit the wealthiest Americans. The way President Obama and Sen. Whitehouse would end this outrageous disparity is pretty simple: By setting a flat 30% tax requirement on the income of millionaires, regardless of the deductions they may be eligible for, the Buffett rule would bring relative equity - at least for the super rich - between incomes made from work and that made from gambling, I mean, "investments." This is not a major overhaul of the tax code, but it would constitute a significant fix without affecting the tax burdens of the middle class or the poor. Sen. Whitehouse will introduce the bill formally on Wednesday, after it has been scored by the Joint Committee on Taxation. Of course, it is likely to earn unanimous Republican opposition, given that party's dedication to serve the wealthy and screw the rest. You know that the current Republican cadre of "leadership" has been clamoring publicly for a "flat tax" for a while now. We have seen before why flat taxes area bad idea - namely that it shifts the tax burden towards the poor and the middle class and away from the rich. But the GOP leadership is lying about even instituting a flat tax. They don't want a flat tax. A flat tax would mean that everyone at all income level pays the same rate in federal taxes. Then wouldn't it stand to reason that the GOP should support the buffet rule to ensure that the rich pay the same rate as the average taxpayer? After all, that would make the tax code a relatively flatter one from what it is as a whole right now - a regressive system. But that is their problem, right there. They talk about a flat tax only because they think you can be fooled by it. Their plan would in fact make the federal tax code even more regressive, shift even more of the tax burden to the poor and the middle class, and zero out the capital gains tax. Their plan would make money made from wealth tax free and those who work hard bear a higher share of the burden (while of course also tearing up our social contract and dismantling the social safety net). What they really want is a flat tax levied on income made from work, while eliminating any shared responsibility for the country's well being from those who make most or all of their incomes from invested wealth. So let's get one thing clear: the GOP does not want a flat federal tax code. 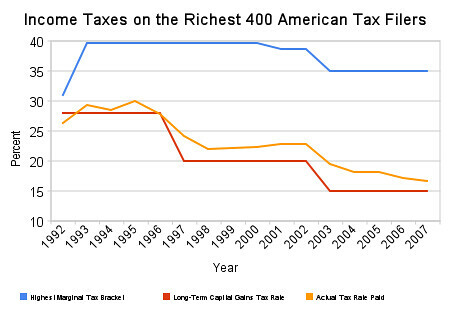 They want a tax code even more skewed to benefit the top than it is today. 2012 is in full swing, and it's time Americans realized that we are not simply choosing between two visions of how to best make America work. We are choosing between two fundamentally different paradigms: the first is a vision that would take this country forward based on the time tested concept of shared responsibility, individual ingenuity and greater and more level field of opportunities for all who are willing to work for it. This is a vision articulated and pursued by President Obama. The other, championed by the Right, is a radical reshaping of the American experiment through the elimination of the very concept of social responsibility and the common good and replacing it with those of an you're-on-your-own Banana Republicanism. The fight this year is existential: namely whether or not this country will continue to exist and strengthen as the beacon of hope where if you play by the rules and work hard, your success is limited only by your potential or if it will become a nation where the doors of opportunity are shut to all but a select few. That is the test. It's not a test for Barack Obama. Nor is it one for Mitt Romney or Newt Gingrich, for that matter. It is a test for the American people. It's about us. It's about whether we will stand up the radical Right's erasing of the pillars of American democracy and the American ideal. It is about whether we will help a president who has fought a lonely battle on behalf of the very idea that is America and for America's poor, middle class and consumers. We must decide whether at the end of the day, America's destiny will be limited and torn down by the greed of economic Darwinism or expanded by the pursuing of economic fairness: the everlasting and quintessentially American ideal of a country where everyone has a fair shot, where everyone plays by the same rules, and where everyone contributes their fair share. Nov 22 When Did the Left Start Defending the Flat Tax?